“Safety is very important for us. We are currently reviewing this, so we cannot say more at the moment”. That was the response of Reuters spokesperson when I requested a comment on cases where Syrian correspondents working with Reuters as freelancers were working without protection gear or safety training in war zones. The same comment was stated by Reuters when international media outlets asked for comments regarding the killing of the Syrian boy Mulhim Barakat in 2013. He was working as a photographer for Reuters, as a freelance, a status that doesn’t confer the same privileges granted to journalists appointed in the news agency. 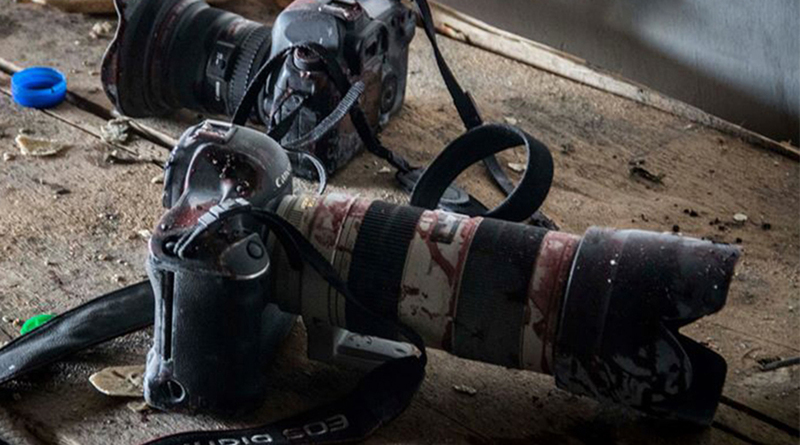 Using Syrian correspondents in covering the war without training or protection led to dozens of them falling victims. International and domestic news outlets were involved in this, including TV stations, news agencies and news portals. This investigation documents many cases considered by rights activists as violations for the rights of Syrian journalists, given the war in the country, and the absence of a union protection or legal protection. Youssef Homos, from Damascus Countryside who currently lives in Turkey, said that he worked for Reuters as a freelancer, from February 2015 to 12 June 2015, when the news agency decided to stop using his services and those of some of his colleagues. Two of his colleagues who requested to remain anonymous said that the news agency suddenly severed ties with them on the same date above, after their colleague Hossam Qattan was injured in Aleppo on 20 May, while working for Reuters. They confirmed that Reuters didn’t sign contracts with them, and that they didn’t take any training courses or receive any protection and safety gear. A spokesperson from Reuters, answering an information request I sent by email, said, “Safety is very important for us. We are currently reviewing this, so we cannot say more at the moment”. The spokesperson didn’t clarify further, but he sent questions to me more than the details he provided. The spokesperson asked which media outlet will publish the report, when it will be published? What’s the deadline for producing the report? He also notified me that, “any further information you can provide about the news outlet in question will be also useful”. Reuters confirmation on safety and stating that the matter is under revision wasn’t different from the response received from it around five years ago when Barakat was killed. Then, the news agency claimed that not stating details about the incident is for the protection of other journalists in the field. Barakat was killed in Aleppo while covering the battle between the opposition forces and the regime. His death, and the photograph of his camera smeared in blood, caused a media uproar at the time. Then, reports stated that he was under 18 years old when he started sending photographs to Reuters in May 2012. Foreign Policy said that, “Reuters gave that Syrian kid a camera, and seven months later he was dead”. A report by France24 said that this is like burying our heads in the sand. Professional media workers, like the American investigative journalist and blogger Corry Ben, said that, “Not because Reuters said Mulhem is a freelancer he becomes freelancer by law. Regardless of this, from a legal point of view, the news agency is responsible for ensuring that he’s able to do the activities it encouraged him to do”. Reuters didn’t reply to a message from me requesting comment on Mulhem Barakat’s story. Four correspondents to the Turkish Anatolia News Agency, who worked in many areas in Syria, said that the news agency didn’t sign contracts with them, nor had they received any training or protection gear. They added that they relied on their expertise gained from working in the field. Some of them watched Youtube videos about how to do coverage in hostile zones. The four correspondents who requested to remain anonymous said that some of them were working for the Anatolia news agency for 2-3 years. Anatolia didn’t reply to my information request sent to their email address stated on their website. I sought to get a comment from them by contacting the person responsible for the Syria affairs in the agency, through facebook. Messages I sent to Ali Dimir, Syria affairs manager, appear to have been “seen” in his inbox, but he didn’t reply. Beside reports on Mulhem being a minor when he started working with Reuters, this investigation covers other cases for minors working with Arab and Western news outlets. A relative of Mohamed Al-Asfar, the photographer at the Qatari Al-Jazeera in southern Syria, killed late June 2015, said that Mohamed started working for Jazeera when he was 17 years old. According to Al-Asfar’s facebook page, and what his relatives and colleagues said, he was born in June 1996. He started working for Jazeera in September 2013. Yassir Abu Hilala, the general manager of Jazeera channel, told me that Jazeera didn’t know that Al-Asfar was a minor when he started working for them. After his death, Jazeera sent 30,000 USD to Al-Asfar’s family; his mother, 15 years old sister, and 10 years old brother. The family now resides in a hotel in the Qatari capital, and Jazeera is paying for their accommodation, according to Abu Hilala. Abu Hilala said that, “in a country like Syria it is hard to ask people you deal with about their birth certificates. And it is hard for us to provide training courses for everyone cooperating with us or everyone we buy photographs from. The situation in Syria doesn’t allow for vetting identification documents”. Even the Syrian Human Rights Monitor, that international media outlets rely on in its reports on Syria, was the subject of complains. The Monitor didn’t remedy the family of the media worker Sami Jawdat Rabah, who used to work fot it then was executed by ISIS in June 2016, among 5 media workers, being accused of working for media outlets. The Monitor published on its official website the news about the killing of 5 media workers, including Rabah. Rabah’s sister and her husband told me that the family didn’t get compensation from the Monitor. Rabah’s sister, in December, sent an email to the Monitor demanding reparation for her killed brother who worked in dangerous environments, which was the reason for his death, and she didn’t get an answer. Syrian media outlets also violated the rights of correspondents. Ahmed Al-Musalma, the freelance correspondent for Qasioun Syrian News Agency, didn’t get compensation for his shrapnel injury while covering the fighting at Al-Manshiya, Daraa, south Syria, in March 2017. His injury need many surgeries. An official from Qasioun, who asked to remain anonymous, said that the agency works with freelance correspondents. The agency used the services of 10 such freelancers in Daraa, while it has 2 people on payroll: the office director and a correspondent in northern Daraa countryside. Ahmed conducted his work without protective gear or training on covering the news in hostile contexts. He said, “I was more like the armed fighters”. Bashar Kamal, the manager at Qasioun, didn’t reply to emails sent to him, asking for information about how correspondents work and about their work conditions. Omar Al-Halabi, the correspondent for “Shada Al-Huriya” channel was injured three times while working, throughout three years, in this channel owned by Sheikh Adnan Al-`Ar`our, who is a clergyman who lives in Saudi Arabia, and is well known for his debates against Shiite. Al-Halabi appeared in reports from the frontlines in Aleppo, and he wasn’t wearing a helmet or body armor. He said that the channel, closed in October 2017, didn’t mention the injury of its correspondents in any of these three occasions. He didn’t get a compensation. Al-Halabi, and Omran Abu Saloum, the correspondent for the channel in Easter Ghouta, Damascus countryside, confirmed that they didn’t get any kind of training on covering the news in conflict and war zones. The channel didn’t provide them with any protection and safety gear, or any instructions on safety. Al-Halabi said that he took this job because he didn’t find a better opportunity, “There are no better alternatives. I mean, this is the only way to do it”. The two correspondents said that the channel is always late in sending payment to its correspondents, by three months, to make sure they keep on working. Abu Saloum said, “we were filming in conflict zones, on the frontline, and we got horrible and great footage, for preparing visual material, for 40 dollars in best cases”. I sent an email and a whatsapp message to Hazim Al-`Ar`our, the manager of Shada Al-Huriya, asking for a comment, but he didn’t reply. I got through the channel’s correspondents audio recordings for Al-`Ar`our, shared from the channel’s whatsapp group, where he’s denying the requests of the correspondents and confirming that there is no work contract or a written agreement with them. The correspondent Khalaf Jum`a said he worked for about two years as a correspondent for Al-Kul Radio in norther Syria, from May 2016. He covered battles and hot zones without protective gear or taking safety courses. In February 2018, the Radio station severed ties with Jum`a after he had to move with his family from Aleppo Countryside to Idlib Countryside. He demanded to take a leave for a while until he finds housing for them. The radio said, “Take your time, no problem”. But the editor Maher Badhli told him after severing ties that, “All correspondents are suffering. The decision is made and we can’t amend it”. The radio station’s manager Yassir Khairallah didn’t reply to my messages requesting comments. Also, no replies came to messages I sent to the official email account of the station, that I got through their website. Saif Ahmed (25 years old), from Homs, said that he used to work as a correspondent to Orient News, a media outlet from the Syrian opposition, owned by the Syrian businessman Ghassan Aboud, who lives in the UAE. The channel severed ties with Said after he corrected through a call, on air, a piece of information from the morning news hour, on 20 May 2017, about the number of displaced people in Al-Wa`ir neighborhood, Homs. The channel sent an email to all correspondents threatening to dismiss them in case any of them behave the way Seif did, on air, and it called on them to work around such situations “smartly” in such cases. When Mohamed Aba-Zeid (also known as George Samara), the correspondent for “Nabd Syria” channel was killed while covering the fighting in Daraa in March 2017, the channel only published an obituary on its website. Mohamed appeared on his facebook page minutes before he was killed, in Al-Manshiya, Daraa, without any protective gear. Aba-Zeid’s widow, Hanan Muhammad a-Lafi, said that Nabd Syria did not sign a contract with him and did not contact her after he was killed to offer any compensation. Hanan provided a copy of a letter she sent to the channel in December 2017 requesting compensation for her husband’s death. She did not receive a response. As part of this investigative report, a survey was distributed to 14 randomly selected Syrian journalists about their work conditions. Some 35.7 percent of the respondents said they work as war correspondents, and most of them had been subjected to more than one type of the violations stated in this report. Representatives of rights groups that monitor the situation in Syria consider poor working conditions for correspondents to be primarily a labor issue. They say the absence of professional unions is the reason such violations occur. “There, justice could be served,” he added. Mohamad Zaid Mastou, the manager of Accuracy Press Institute, a non-profit organization in the United States that works to monitor Syrian media and provide journalism trainings, said the absence of labor laws protecting journalists opens the door for outlets to ignore the protection of journalists. “In the case of the absence of legal responsibility, there is an ethical responsibility that media outlets should fulfill,” added Mastou. Sherif Mansour, the Middle East and North Africa coordinator at the Committee to Protect Journalists, said “we do not document cases of working conditions in media outlets, but we issued guidelines and reached out to international and regional media outlets to stress the need to protect journalists, especially in conflict zones”. Ali Eid, the head of the Syrian Journalists Association in Turkey, stated that the phenomenon of media outlets seeking to hire journalists as “freelancers” is problematic, with ethical and legal repercussions. He added that outlets seek to stay clear of any responsibility when a journalist is kidnapped, injured or killed. The freelance system, in which a journalist is paid on a piece-by-piece basis, became widespread in Syria after 2011, Mohamed a-Satouf, a researcher at the Syria Center for Media Freedoms, which belongs to the Syrian Journalists Association, said. Freelancing allows reporters to work for multiple outlets with no contracts. A-Satouf said there should be an ethical commitment towards journalists from each outlet, especially if the outlet is Syrian, was established after the revolution, claims to abide by the media’s ethical codes and seeks to support media freedoms in the country. A-Satouf also provided numbers and statistics that the Center for Media Freedoms has documented of violations against Syrian journalists and the parties responsible for them between March 2011 and February 2018. Unless demands for better working conditions move from calls by rights organizations to measures implemented on the ground, it is impossible to know how many other young Syrians could face the same fate as Mulhem and his colleagues.